I am not a huge fan of poetry, especially poetry prior to the Jazz age or the Harlem Renaissance. 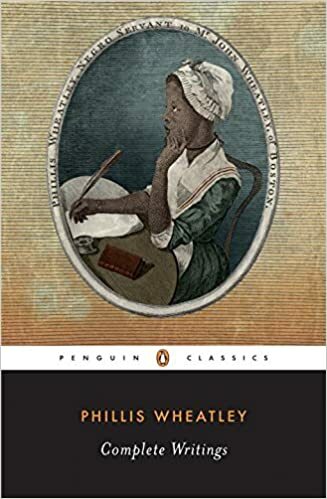 I read a few of Phillis Wheatley’s poems in college in an American Literature class. I thought interesting, but I was underwhelmed. I didn’t get what the hubbub was about it. Don’t get me wrong I knew then that it was big deal for a slave to read and write. I just didn’t find her writing particularly spectacular and therefore dismissed her. In one of my book clubs someone suggested reading a book of poetry and someone else said Phillis Wheatley. I’m pretty sure I grimaced at the thought of plodding through that. It wasn’t selected, but I did decide to give her another go. And I have to admit that it was better than I thought. So, after 20+ years and a little mental maturity what once underwhelmed me is proving to be much more. In 1761, a young girl arrived in Boston on a slave ship, sold to the Wheatley family, and given the name Phillis Wheatley. Struck by Phillis’ extraordinary precociousness, the Wheatleys provided her with an education that was unusual for a woman of the time and astonishing for a slave. After studying English and classical literature, geography, the Bible, and Latin, Phillis published her first poem in 1767 at the age of 14, winning much public attention and considerable fame. When Boston publishers who doubted its authenticity rejected an initial collection of her poetry, Wheatley sailed to London in 1773 and found a publisher there for Poems on Various Subjects, Religious and Moral. This volume collects both Wheatley’s letters and her poetry: hymns, elegies, translations, philosophical poems, tales, and epyllions—including a poignant plea to the Earl of Dartmouth urging freedom for America and comparing the country’s condition to her own. With her contemplative elegies and her use of the poetic imagination to escape an unsatisfactory world, Wheatley anticipated the Romantic Movement of the following century. The appendices to this edition include poems of Wheatley’s contemporary African-American poets: Lucy Terry, Jupiter Harmon, and Francis Williams.